RORY’S already considerable reputation having been recently enhanced with a string of British and American concert appearances, it takes a further stride forward with the release of this exciting album, which is well representative of what his fans expect. In fact the first three tracks - Used To Be, I’m Not Awake Yet and Don’t Know Where I’m Going - showcase contrastingly different sides of the band’s music in rock and roll, blues and a country and western tinged style. It occurs to me that at times the sound isn’t as full could be and this may be due to a lack of production (Rory’s own), but it doesn’t detract from the over all goodness of a mighty fine album that is of the type much needed in these days when so much mediocrity has crept into the business. Rory is a guitarist and showman supreme and listening to his sterling work on Deuce one can imagine him moving about the stage as he does. Gerry McAvoy’s bass work is of a high quality and Wilgar Campbell demonstrates his very good drum technique on more than one occasion. Going to concerts and festivals and enjoying Rory’s trio is one of the things I shall miss when I leave this business at Christmas time and I shall take this album with me to recall some of the good times I’ve had in the past twelve years. 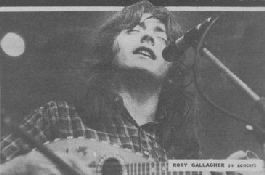 Of the individual tracks, Used To Be is rock and roll with special lead guitar licks and some nice drumming and I’m Not Awake yet lays the misconception that the trio is just Rory with two blokes in support. On this number, Gerry’s bass lines are particularly good. There’s A Light is another prime example of teamwork and Maybe I Will and Crest Of A Wave have unexpected changes of tempo that alternate between rock and flowing tones. Whole Lot Of People has the sort of roaring Rory Gallagher solo that sends fans into ecstasies as has the next track, In Your Town, another rocker which sounds as if a bit of Elmore James influence has crept in - it’s a stormer of a number that should be used as the plug track. R.G. Other tracks: Should’ve Learnt My Lesson, Out Of My Mind.